It feels like my sinuses are trying to crawl out of my ears or maybe push my eyes out of my head to have more room to swell up, so hopefully this post will make at least some sense. No promises. Last week when I was swatching Sinful Colors' Haute Rebel spring collection, I figured it was a good time to finally wear a few others I hadn't worn yet. Bali Mist blew me away, completely. 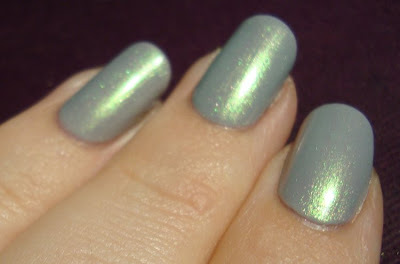 You Just Wait is another ugly duckling that looks odd in the bottle, but way better on the nail. It doesn't pack quite the same punch as Bali Mist...but few things do. It's not as bold, but it still has a great shift and layers nicely. I tried two coats over Mauve first, a grayed pastel purple. At its meekest, it's a touch of soft pink and green shimmer that hints at wanting to glow. It's sheer enough to let the base color come through, but it really adds some oomph. I wasn't crazy about Mauve on me, but I liked it a lot more like this. Still not my kind of color, but this was fun to look at and full of personality. It has its pearly moments too. Then at other angles, the shimmer turns a warm pink. At more extreme angles, the pink takes over and really glows. I wanted to see how much it changes the base color, so I tried it over Cool Gray too. The base barely changes at all! Yay! The shift seems to behave a little differently over gray than it did over purple. I couldn't get it to show the pink and green at the same time, no matter the angle. The green was really coy in this combo, but when it did come out, it showed up better than it had over Mauve. For some reason, it would only show green for the camera when my hand was flat. Weird. I'd recommend You Just Wait, if you don't have it already. It's an ideal layering partner for pastels and it applies really smoothly. If you have it, sitting idle like mine was, try it out! I'm gonna have to wear it over a darker shade sometime too.